Smoking is not good for any individual. And the outcome of this addiction is way scarier when the smoker is a mother-to-be. 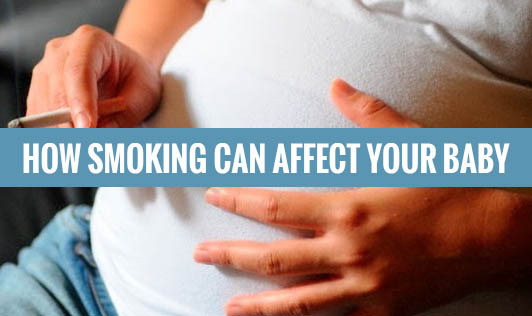 Smoking takes a serious toll on the health of your baby. Let’s take a look at what smoking does during pregnancy. Level of carbon monoxide can cause suffocation and affect the fetus. The heartbeat of the fetus can be raised beyond normal resulting in fetal distress. The baby inside the womb may develop orofacial defects like a cleft lip or palate. Smoking could sometimes result in miscarriage as well. The baby may be born with congenital lung problems. There are higher chances of the baby being born with some sort of limb deformity. Smoking increases the risk of premature birth as well as stillbirth. Smoking must be given up immediately if you dream of having a healthy and happy baby. If you are planning on having a baby anytime soon or are pregnant, please take action and quit smoking now!